Describing the city is not a neutral, transparent activity […] but a structuring activity which builds up its speech objects according to how it organizes, categorise and situates them among the others, attributing them to authorized or marginal voices […] The oral and interactive methods allow to analyse how the description of the city is co-built among the interlocutors, sometimes is negotiated among them (from: Lorenza Mondada, Décrire la Ville, Anthropos, Paris, 2000). During the year 2000, I carried on with a search unit of the Department of Town and Territorial Planning of Florence University the research "Florence Insurgent City. Microstories and cartography of changes" inquiring and mapping which 'ferments' and 'social restlessnesses' mark the city with spatial effects, contributing to construction, reconstruction or refilling of meaning of the urban spaces, and prefiguring a new dialectic interaction between all the different social energies acting in town, as powerful or marginal voices. The research tries to let the 'alternative social heritage' of Florence emerge and show if this "thousand of tiny empowerments" (already into action in the living existing practices) could be red as a base for suggesting new insurgent planning practices. 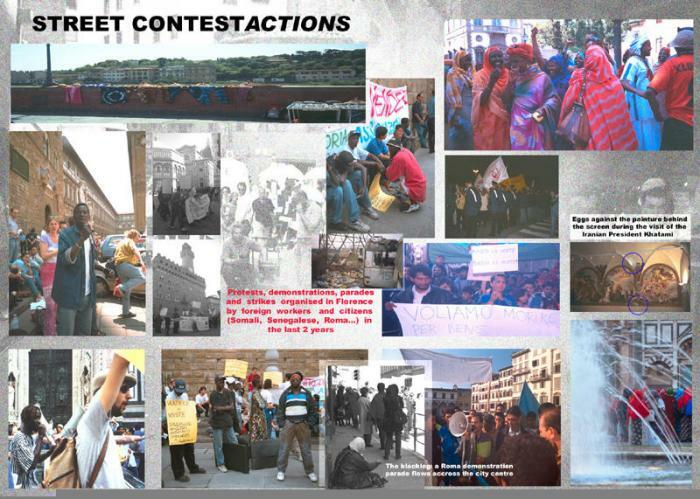 The geography of 'counter-voices' in the present Florence history and that of 'tiny affirmative actions' performed in its urban spaces (network of social centres, squatted houses and self-renewal projects, "wild zones" and marginal markets, alternative medias, street-arts, performances, and so on) include the enrichment led by immigrants. The research avoids to 'confine' them in thematic sessions, but tries to read them as 'nodes'of networks in the different spaces they cross and forge, as 'bridges' contributing to knit fragmentary episodes in the reconstruction of the city and in the changing of meaning of the urban spaces. The modalities of 'participative' and 'compromised' listening used for picking up the foreign voices (familiar networks, national communities, new shapes given to corporative and cooperatives collectivities, but also individuals) have promoted a 'skidding of accent' in the research work. 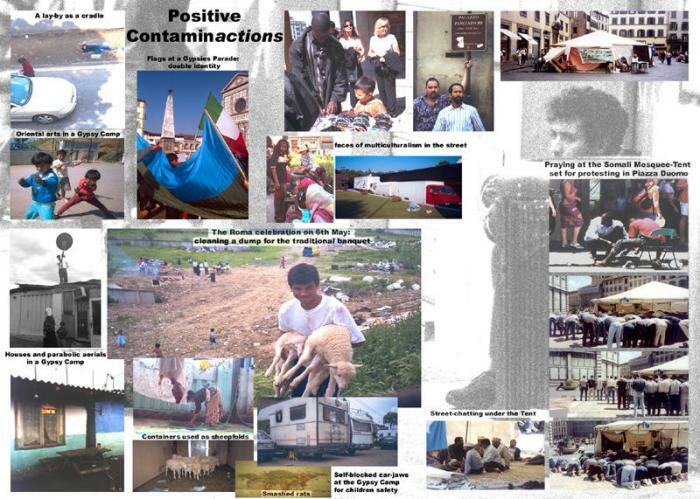 In fact, reproducing in tales, photos and maps (tightly interconnected) the 'deep listening' of the multiple points of view of the immigrants voices on Florence, is not only a way to examine and revaluate phenomena generally ascribed to a 'semantic marginality' but with strong and concrete special effects. It also serves to draw a panorama of 'new glances and gazes' on the town, which could be red as interpretative keys and atypical and stimulants proposals offering the chance of a positive renewal for the territory and the organisation of society and institutions. In the research, some recent episodes are more deeply analysed as examples of new waves of constructive protest promoted by immigrants: the Senegalese protest against the shooting of the US movie 'Hannibal', the sequence of events that carried to the multiethnic market, and the experience of the Tent-Mosque at Duomo square, built in June/August 2000 by the Somali Community. The latter experience - especially - well represents how the 'colouring' of urban spaces can enrich the places, stimulating or 'forcing' the inhabitants to reflect and rediscover the meaning of public spaces as a result of actions stratifying themselves and gradually changing the paper of those spaces within the whole city, and how they will be used for the future. The final research outlines (a book and an Internet site with 'sensitive maps') try to show a 'growing up structure'. So, in their first half they host more 'traditional' ways of mapping and representing the phenomena (including some 'interrupted maps' deserted after external events that revealed their 'reactionary accent'). In the second part, they try to comply and respectfully fit in with the phenomena 'voices' and 'modalities', purposing the listening and the coordination of the interviews outputs as the 'pivotal centre' for renewing the planning and the managing of town spaces, according to the principles of participation and multiculturalism that only can lead to a conjugation of democracy, efficiency and effectiveness in governing the urban territories.